Well Melly While I was having a little distraction from my job search, I can across this article and fell love with the bottom image that I have reposted here. Don't you just wish all this was in our studios? 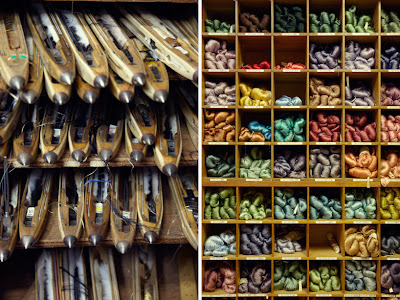 Now that would make you want to go there just to look and the beautiful threads wouldn't it? This would be a picture of my loom finally working! honestly I nearly cried. Of course, I do have a mechanical problem to work out - it still skips the odd lift but by and large it's pretty good! Onward weaving!